RI-MAN, a five-foot tall humanoid robot, is the latest in a series of prototype robots intended to assist with one of Japan's most pressing problems; the care of its older citizens. RI-MAN can see and follow movement, it can hear and process commands - it can even smell odors that might be relevant to health care. Update 08-Nov-2006: More details about RI-MAN are available; see RI-MAN Face Tracking, Electronic Nose Robot Update for details. In the demonstration, a researcher orders RI-MAN to pick up a woman. "The woman on the bed?" asks the robot. "Yes," says the researcher. The robot comes closer and gently picks up the woman (actually a life-like doll weighing 25 pounds) by carefully supporting the back and legs. "I succeeded in holding her," the robot says at the conclusion of the exercise. Japan is expected to have one of the largest populations of senior citizens, at the same time that its birthrate is dropping. By the year 2020, Japan expects that about twenty-five percent of its population will be over sixty-five years of age. Roboticists are not the only people thinking about this problem; science fiction writers and manga/anime creators are as well. 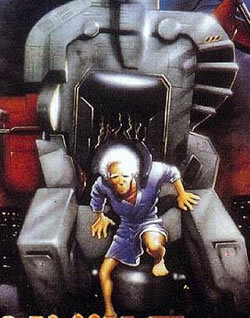 In the future world of Roujin Z, an anime film introduced in 1996, the Ministry of Health orders Takazawa Kijuro, an elderly bed-ridden man seemingly without family, to test a new robot - the Z-0001. A self-contained atomic power reactor gives this unique part bed/part machine robot all the energy it needs. The man is literally wired into the bed; it contains all manner of gadgets to tend to physical needs. The film seems to have a lot of interesting elements; it turns out that the Z-0001 also has a military bent to it. It is also able to take other machines and augment itself. Interested in health care robots? Read about ERNIE The Robot Pharmacist - More Accurate Than Humans, the Trauma Pod Battlefield Medical Treatment system and the da Vinci surgical robot. Read more about the RI-MAN robot here and at the RI-MAN robot site. Also, read more about Roujin Z. I originally found this idea on Slashdot, but I can't find the reference.